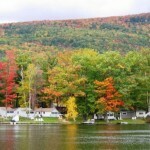 The locality of Lake Dunmore rings the northern half of the lake of the same name in the town of Salisbury, Vermont. Thousand-acre Lake Dunmore is warm, calm, and crystal clear, a delight for fishermen and families, and adjacent to Green Mountain National Forest hiking. Brandon and Middlebury are within a short drive.